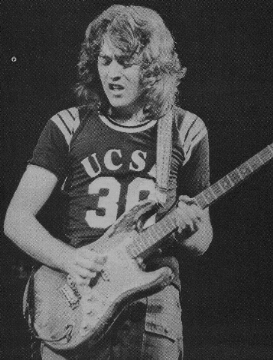 RORY GALLAGHER is a guitar player. He writes songs, leads a band, produces his own records, plays a bit of mandolin and a bit of banjo, but above all he’s a guitar player. He has less image than almost any other guitar player in the world – the only strong identifying tag, the instrument he uses, a guitar which must be the world’s worst looking Fender Stratocaster. Despite his protests – “I hate being dubbed as ‘hard working Rory’.” – Gallagher goes out and gets it on in country after country, month after month, leaving little time for his precious home life in Eire. He’s a guitar freak, in the true sense of the word. Being an aspiring guitar player in Southern Ireland wasn’t as easy as it was in Manchester or London in the late fifties and early sixties. 12 or 13 years later Rory is still playing the same guitar he bought when he was 15. "I’ve got a Telecaster as well now and I have gone through periods when I’ve thought about changing my guitar, but I suppose I’m far too sentimental about the instrument. There’s also an element of superstition attached to it. That Strat’s really had it. I sweat a lot when I play and over the years the body’s absorbed a lot of moisture. I’ve often thought that it’s come to the end of its life. Recently two pick ups packed up together, they just cut out when I was playing. I was terrified that I wouldn’t be able to get new pick-ups to sound the same, but fortunately they matched perfectly." “I’ve always wanted to get that Gibson sustain out of my Fender. I’ve borrowed Gibsons and tried them, you get the sustain, but you can never get that clarity of sound that you get with a Strat. The controls seem all wrong to me on a Gibson as well. When I play one I’m looking for the controls and I discover that they’re way below my hand and that I’m lifting the guitar up to reach the controls. I like to get that sort of phase sound by using the volume swell on the Stratocaster which I’m playing as well, and that’s impossible on a Gibson. I use a Rangemaster treble boost unit on stage to give me a lift and sustain effect and I find that it comp­ensates perfectly. “I’m using Fender Rock and Roll strings at the moment. I’ve been with them for some time because you can get them easily anywhere in the world and they perform very well. I’ve tried Ernie Ball strings and I used Clifford Essex Strings for quite some time, but I’m fairly settled now with Fenders. “Talking about that guitar, I’m amazed that despite its age I’ve never even had to adjust the truss rod. I’ve taken it to the hottest countries in the world and it just never moves, it’s great I’ve had it re fretted a couple of times but apart from that very little’s been done. Rory uses a Fender Bassman through four 15” speakers on stage. His old love, however is an AC30. Rory plays guitar every day. That may sound fairly commonplace, but it’s not for an artist that is working every other day. The obvious deduction is that he still loves the instrument. Getting the time is something that Rory has trouble with. Why does he tour so much? “I think it’s a form of discipline in itself. I think I’d get terrible lazy if I took a year off or something like that. I’d start following the business through the music press or through people telling me things and that’s not always a true picture of what’s going on.... you only really find out when you’re playing. I suppose I grew up believing in people who were traveling players. I’d be happy just to be a player going around in the back of a Volkswagon van if I could ,you know, the hobo musician. Rory has become an international star in the true sense of the word. He started this year with an incredibly successful tour of Japan and he’s touring all over Europe (including a British tour) before summer. On the record scene he’s consistently a big seller, especially in the U.S., but it’s in this area that he feels there’s room for improvement. It’s in the studio that Rory admits that something is missing. Many players complain that traveling and heavy tour schedules destroy their development on their chosen instrument. The tiredness and the boredom take their toll.